Amatrol’s PLC Troubleshooting Learning System-AB ControlLogix (890-AB5500) teaches troubleshooting, programming, and applications of Allen-Bradley’s ControlLogix PLC. The programmable controller is considered by many to be the most important development ever in industrial automation, because it is a prepackaged, industrially-hardened computer that can be quickly programmed to control a wide range of industrial processes and machines. The A-B ControlLogix training system adds to the Programmable Controller Troubleshooting Workstation (890-PECB) and also requires a computer and RS Logix 5000 PLC programming software. 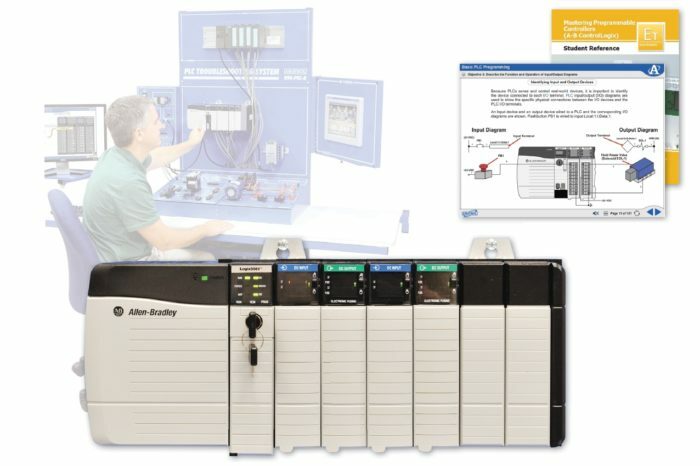 The A-B ControlLogix training system includes an Allen-Bradley PLC with ControlLogix 5000 processor, an I/O Connector Kit, and a Fault Insertion Engineering Integration and Connector Kit. These components will be used to cover a wide variety of PLC topics, applications, and skills, such as PLC operation, communications, programming, motor control, I/O interfacing, timer and counter instructions, and systems and I/O troubleshooting. The ControlLogix 5000 is a PLC that learners will actually find in automated manufacturing facilities and other industrial settings, so the skills and knowledge that they gain from the A-B ControlLogix training system will be directly applicable to real-world environments. Design a PLC Program that Controls a Centrifugal Air Compressor and More! The A-B ControlLogix training system includes a ControlLogix 5000 PLC, thirty-two 24 VDC discrete inputs and outputs, a PLC programming cable, an I/O connector kit, and a fault insertion connector kit. This system will be used to practice real-world, hands-on skills like: designing a PLC program that uses subroutines to control a motor application with an alarm; testing a PLC discrete output module; troubleshooting PLC power supply problems; designing a PLC program that controls a centrifugal air compressor; and more! The A-B ControlLogix training system’s curriculum features a stunning depth and breadth of PLC programming and troubleshooting knowledge. Within this curriculum learners will study the function and operation of the OTL and OTU instructions, PLC seal-in logic, a time-driven sequence program, FRD instruction, controller status flags, and more. Its highly-interactive multimedia format features all of the skills and knowledge included in the printed curriculum with additional 3D graphics, videos, voiceovers of all text, and interactive quizzes and exercises. Additional, advanced training is possible with the A-B ControlLogix training system by adding one or more of the following optional systems: Analog Application (89-AS-AB5500), ControlNet (89-CN-AB5500), EtherNet (89-EN-AB5500), and PanelView Plus (89-PVAB5500). A sample copy of the Mastering Programmable Controllers Student Reference Guides is included with the learning system. Sourced from the system’s curriculum, the Student Reference Guide takes the entire series’ technical content contained in the learning objectives and combines them into one perfectly-bound book. Student Reference Guides supplement this course by providing a condensed, inexpensive reference tool that learners will find invaluable once they finish their training making it the perfect course takeaway.